This weekend marks five years since the City of Fremantle’s award-winning Esplanade Youth Plaza opened to create an engaging inner-city hub for young people. The City is celebrating this milestone, together with WA Youth Week (13-20 April), by hosting the EYP Festival 5.0 this Sunday at the Esplanade Youth Plaza. 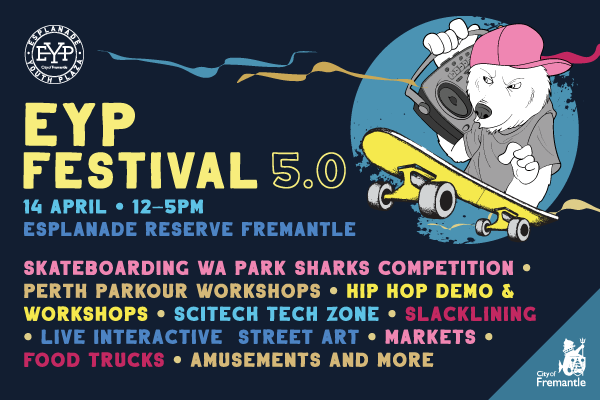 “The family-friendly event will include a skateboarding competition in association with Skateboarding WA, slacklining and parkour workshops, fascinating virtual reality stations, live interactive street art, Hip Hop classes, market stalls, amusements and so much more,” Mayor Pettitt said. While the project initially received strong opposition from some community groups, the Esplanade Youth Plaza went on to rejuvenate the area and encourage more young people to enjoy Fremantle, even becoming a significant tourist attraction. “It’s fantastic to see how the Esplanade Youth Plaza provides a safe and welcoming environment for the whole community,” Mayor Pettitt said. “On any given day you’ll see young people, families and adults alike enjoying the plaza’s facilities. Skateboarding WA Director Ben Bowring has also seen first-hand how the Esplanade Youth Plaza has benefitted Fremantle and fostered a special community. “The plaza has helped Fremantle maintain and grow its identity around the world as a first-class destination for skateboarders,” Mr Bowring said. “People of all ages and skill levels can come together, skateboard, make new friends and challenge themselves in a supportive environment.